Some of our recent blogs have looked into the ‘secret life of cats’ and how their innate behaviours influence a cat’s day to day activities. We have also looked at many of their unwanted behaviours, including spraying, scratching and hunting. One product that seems to be recommended time and time again when discussing undesirable feline traits is Feliway. Vets, nurses, and behaviourists alike will often advise that used alongside behavioural modification, Feliway can turn the fiercest leopard wannabe into a purring ball of fluff. So how does Feliway actually work? Feliway works by releasing pheromones which act to relieve stress and anxiety in cats, but why is it that pheromones are so important to cats? Pheromones are chemical signals which are used for animal communication. Cats are predominately ruled by facial pheromones. This is why you will often see your cat rubbing his face on objects (and people) in the house. The action of rubbing deposits pheromones that act as a message to other cats in the area. Not only do these pheromones communicate claimed territory to other cats, but also act as a reminder to the cat itself. The pheromones act to remind the cat that this is their territory, reinforcing a feeling of safety and security. 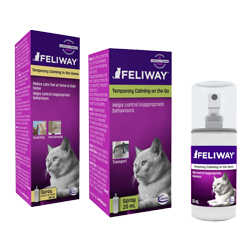 Feliway is a chemical copy of one of the facial pheromones (F3), which when diffused into the environment using the Feliway Diffuser or sprayed directly onto furniture, mimics the natural facial pheromone as a reassuring message. As a consequence, its helps the control of undesirable behaviours as the cat is likely to be less stressed, upset and threatened. Scratching: This is a perfectly natural behaviour, however when not confined to a scratching post can be rather costly! Cats scratch not only to sharpen their claws, but also to mark their territory which can often be confined to a good quality scratching post strategically placed in the home. Cats who excessively scratch on furniture and other areas in the house may be feeling threatened and stressed, therefore the introduction of Feliway can help to manage the situation. Using the Feliway spray directly on the area that is being targeted by your felines claws can help to reduce stress. See our blog on cat scratching for more information. Spraying: All cats, male or female, neutered or not will mark out their territor y with urine spraying. Cat’s spray can be a reaction to a stressful situation. During these situations cats will spray urine to increase their self-assurance, to cope with emotional stress, or as a displacement strategy to soothe itself. While it is completely normal for cats to spray outdoors, when your cat sprays indoors it is a sign that they are feeling distressed. Using Feliway Spray is a clinically proven way to curb spraying indoors, something that will help your cat feel relaxed and reduce spotting on your walls and furniture. Travelling: Cats are extremely territorial creatures, therefore when removed from their own environment can become very stressed and upset. Just a few sprays of Feliway inside the cat carrier and your cat will feel more relaxed and make your travels together a more pleasant experience. Unfortunately for Cats, the most common reason for travelling is a visit to the vets, which can add more stress. It is worth mentioning to your vet if you have a particularly poor traveller as most good vets utilise Feliway for nervous clients, usually having a diffuser in the consulting room and even spraying their hands with Feliway prior to contact with the cat.